We are set for the Kansas high school football playoffs as Week 9 wrapped up the regular season for all classifications. Friday night’s action featured Class 6A, 5A, and 2-1A teams taking center stage, while 4A, 3A, and 8-Man teams predominantly completed their season on Thursday night. There will be a new Class 6A champion and runner-up as both defending champ Shawnee Mission West and Hutchinson will miss out of the playoffs this season. Shawnee Mission West fell 17-14 to Shawnee Mission Northwest on an emotional night where Andre Maloney’s No. 29 jersey was retired. Maloney, an all-state caliber player, passed away earlier this season after suffering a stroke during a game against Leavenworth. Meanwhile, Hutchinson won on Friday night beating Maize 33-31, but still missed out on the playoffs. Maize jumped out to a 10-0 lead and scored on a Connor Lungwitz touchdown run as time expired in the first half to lead 17-12 at halftime. The Eagles extended their lead to 24-12 in the third quarter before Hutchinson would rally. The Salthawks converted a fourth-and-9 at midfield and scored three plays later to take a 26-24 lead with 6:14 remaining in the game. The Salthawks would add a touchdown shortly after and lead 33-24. Had the game ended at that score, Hutchinson would have been the District 8 champions and reached the playoffs for a 14th consecutive season. But Maize added a late touchdown to pull within 33-31 and coupled with a big Garden City win over Dodge City, Hutchinson was left out of the playoffs due to the district points system that determined the playoff participants in this three-way tie. It is the first time since 1999 that the Salthawks will miss the postseason. Speaking of the Hatchet Game, Garden City reclaimed the prize in the 115th meeting between the two schools with a 41-20 win over Dodge City. Senior quarterback Greyson Tempel accounted for 363 yards of total offense and had a hand in four touchdowns to lead Garden City. Tempel rushed 18 times for 157 yards and two scores and passed for 206 yards and two more touchdowns. Garden City held the Red Demons on downs mid-way through the fourth quarter after Dodge City had recovered an onside kick. Had Dodge City tacked on a touchdown, Garden City would have been left out of the playoffs and Hutchinson would have won the points tie-breaker to claim the runner-up spot. Kelan Newton passed for 235 yards and a touchdown to lead Dodge City. Top-ranked Derby won the battle with Wichita Heights for the 6A District 6 championship by beating the Falcons 28-6. Garrett Xanders scored three touchdowns to lead the Panthers who will be the top seed on the western half of the 6A bracket. Junction City got a late touchdown by Ron Wilson to break a 10-10 tie and beat Manhattan 16-10. Manhattan drove to the Junction City 26-yard line late in the game, but could not convert a fourth down. The win by Jucntion City and Topeka High’s win over Washburn Rural left 6A District 5 in a three-way tie at the top. The district points system was used to determine the playoff qualifiers, giving Topeka High the district championship and Manhattan the runner-up. Despite their win on Friday night, Junction City misses the playoffs for the third consecutive season. The game of the night may have been in Class 5A where Troy Burgett kicked a 24-yard field goal as time expired to lift Blue Valley West to an 18-17 win over Blue Valley. Blue Valley West shutout the Tigers in the second half and scored 12 points of its own in the fourth quarter to pull out the win. Blue Valley lost three second-half fumbles to allow the Jaguars to stay in the game. Burgett connected on a 32-yard field goal with 6:11 remaining in the game to pull the Jaguars to withing 17-15. Grant Garcia rushed for 116 yards and a touchdown on 14 carries for the Jaguars. Chance Nelson led the Tigers with 113 yards rushing on 20 attempts. Sam Steinlage and J.T. Rosine each rushed for a pair of touchdowns as Centralia shutout Jackson Heights 36-0. The Panthers’ clinched the District 1 championship with the win, while Jackson Heights missed the playoffs despite a 7-2 record. The Cobras lost to Troy 18-12 in overtime in district play giving Troy the other playoff spot. Paola edged Frontier League rival Louisburg 23-17 in double overtime on Thursday night to claim the District 5 championship. ExZavier Miller scored in the second overtime to lift Paola to the win. The Panthers and Wildcats had traded field goals in the first overtime after ending regulation tied at 14. Kingman held off Garden Plain to win the 3A District 11 championship and clinch a playoff berth for the first time since 2005. The Eagles scored 18 points in the second quarter to build a 24-7 halftime lead. Garden Plain pulled to within 24-14 late in the third quarter when Alex Becker hit Kody Koester on a 12-yard touchdown pass. Kingman would respond with a 38-yard touchdown run by Braxton Bangert that gave the Eagles separation and knocked Garden Plain out of the playoffs for the first time since 1998. Yates Center built a 38-14 halftime lead and held off Uniontown to clinch the district runner-up spot in Eight Man, Division I, District 2. 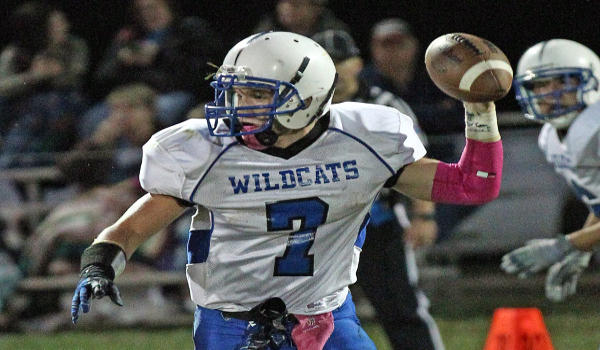 Uniontown outscored the Wildcats 22-0 in the second half, but Yates Center held on for the 38-36 win. The Wildcats advance to the playoffs for the first time since 1990 and will play at West Elk on Tuesday night. West Elk beat Yates Center 52-6 back in Week 2. Prior to this season, Yates Center (6-3) had won just four games since the beginning of the 2004 season, while suffering six winless seasons during that time.